To purchase or find out more about any of these albums, or to listen to samples of each track, simply click on the above icons or scroll down this page for a summary of each album. Backing tracks are available for selected songs. These can be ordered as mp3 files that will be emailed to the purchaser, or on CD (or DVD) which will be sent by mail to the purchaser. Bernard's recording studio is available for hire. To find out more about Bernard's recording studio and its capabilities: click here. This web site uses PayPal's secure merchant facility for all credit card purchases. Prices quoted are in Australian Dollars, exclusive of postage charges and GST. (GST will be added to purchases for delivery within Australia). Postage charges and GST are shown on the PayPal shopping invoice. Click on the album's icon or the "more on this" button next to it, then click on the speaker icons next to each song title on the album's detailed page. Lyrics for Bernard's original songs on these albums are also accessible through these pages. 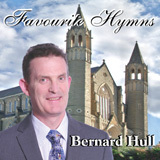 A brand new album of favourite hymns all with Bernard's fresh, contemporary arrangements.